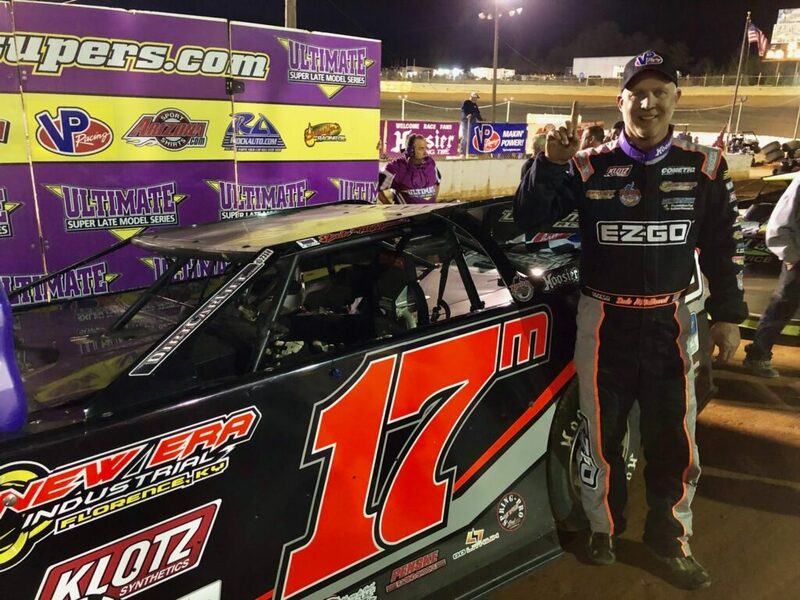 Bulls Gap, Tennessee – Volunteer Speedway opened the 2019 racing season Thursday night with running of the ULTIMATE Super Late Model Series $10,000 to win Spring Thaw and when the checkered flag waved Dale McDowell of Chickamauga, GA was parked in victory lane winning over Jimmy Owens and Brandon Overton. McDowell led the way in qualifying after he turned a lap of 12.276 seconds around the 4/10 mile clay oval. That time beat out the efforts of Michael Chilton, Shanon Buckingham, Owens and Robby Moses. Owens earned the pole position for the feature when he won the first heat race of the night ahead of McDowell, Ross Bailes and Donald McIntosh while Chilton would start the main event from outside the front row due to his win in the night’s second preliminary over Overton, Moses and Cla Knight. Buckingham took the third and final heat of the evening ahead of Ryan King, Zack Mitchell and Vic Hill. At the start of the 50-lap feature it would be Chilton jumping to the early lead with Owens, Buckingham and McDowell trailing. Overton improved his position on the second circuit when he passed by McDowell to take fourth. Both of those drivers then closed in on the third running Buckingham as they fought over the third position in the running order. Owens closed in on Chilton and challenged the early front runner multiple times before finally taking the lead on lap 13. That began a downward slide for Chilton as Overton moved around the No. 97 for second on lap 14 and McDowell slide passed on lap 16 to gain third. The top-3 of Owens, Overton and McDowell ran in tight formation as they worked through some heavy traffic in a race that had not seen a caution up to its halfway point. On lap 24, McDowell took the runner-up spot away from Overton and began stalking the race leading car of Owens. The move that would decide the outcome of the race came on lap 31 when Owens was briefly held up by a slower car. McDowell seized the opportunity and made a three-wide move going into turn one that would put him in front of both Owens and the slower machine. The race’s only caution flag waved on lap 34 when Daulton Wilson’s car came to a stop in turn two. 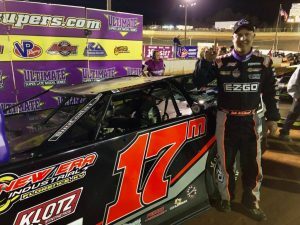 Following the ensuing restart, McDowell pulled away from the pack driving his Sweet-Bloomquist Race Car, powered by a Clements Racing Engine and sponsored by E-Z-Go, New Era Industrial, Quality Natural Gas, Kinzer Drilling, C&S Transportation, Cometic Gasket & Klotz Lubricants to the checkered flag and $10,000 win over Owens, Overton, Buckingham and Bailes. Rounding out the top 10 finishers were McIntosh, Mitchell, Hill, Moses and Chilton. Rusty Ballenger won the Crate Late Model race over Tim Byrd, Gary Crittenden, Ahnna Parkhurst and Ross White. Aaron Guinn won the Sportsman Late Model race over Brad Seagle, Kip Sawyer, Warren McMahan and John Adams. Wayne James won the Open Wheel Modified race over Wade Rookard, Tyler James and Jeff Akard. Sportsman Late Model: 1. Aaron Guinn, 2. Brad Seagle, 3. Kip Sawyer, 4. Warren McMahan, 5. John Adams, 6. Tracy Wolfe, 7. Floyd Self, 8. Roger England, 9. Brandon James, 10. Chad Smith, 11. Cody Brake. For more information regarding Volunteer Speedway please visit the website at www.VolunteerSpeedway.com or contact Doug Gillenwater at (423) 676-9080. Special thanks to Richard Allen with www.InsideDirtRacing.com for being at Volunteer Speedway and his live updates coverage of the Spring Thaw. Also, Bob Dillner with www.Speed51.com for live video. Plus www.DirtOnDirt.com video graphed Richard Ford.